You are here: Home / Blog Entries / Do I Need a Degree to Become a Paramedic? Do I Need a Degree to Become a Paramedic? To become a paramedic, you need to be properly trained and educated. But do you actually need a college degree to become an EMT-P? The answer is no. You can enroll in a paramedic school and program that simply offers you a Paramedic Certificate, allowing you to then take the NREMT exams and apply for state licensure. However, there are some advantages to staying in school longer to actually earn a degree. The first centers on salary. Earning an Associate’s Degree in Paramedicine Science, for example, allows you to show a potential employer that you’ve successfully excelled in a longer, more in-depth paramedic program. You’ve received more training, experienced more hours of instruction and received more clinical supervision than others in your field. This can give you a leg up in an already competitive job market. The second advantage to a paramedic degree is job advancement. Working as a paramedic is a wonderful and rewarding experience, but it can also be a stepping stone to other careers in health care, like a physician’s assistant (PA), a registered nurse (RN), or an EMS educator. Not only can an Associate’s Degree help you with career advancement, but academic advancement too, should you decide you’d like to transfer to a four year college. So is a paramedic degree a necessity for prospective students? No. But it certainly gives you more options. 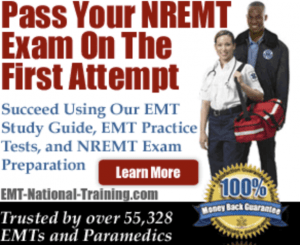 What’s the Best EMT Study Guide?